You don’t have to break the bank to invest in the best water shoes, but it may be the wisest investment you make the whole summer. Check out the list below on the top 10 best water shoes in 2019 for your feet this coming summer. These water shoes benefit from years of industry experience. As such, they have been designed to offer comfort to a mobile lifestyle and they do exactly that. They come fitted with a toe and heel bumper to offer protection when working under unfavorable conditions. What I really love about these water shoes is that they don’t rub in any locations. They act as the perfect waterproof and breathable barrier between your feet and the elements. To ensure that they fit snugly and have no chance of coming off even under the most vigorous of activities, they come with the X-band design at the top. The Shasta Water Shoes have the non-slip feature, meaning you won’t slip even when the ground gets slippery. So good looking are these shoes that they can double up as your normal everyday shoe. On the downside, quality control seems almost non-existent with this unit. If you check two different sizes, you will notice some color and/or design difference. If you are shopping for any water shoes that fit great and can be used for basic water ventures then I highly recommend Northside Men’s Brille II water shoe. This shoe was designed to withstand whatever your active lifestyle throws at, or on them. These water shoes provide the perfect blend of nylon mesh and neoprene, with a TPR outsole to protect your feet in and out of the water. With this design, they offer traction on slippery surfaces, as well as dry really fast once you come out of the water. 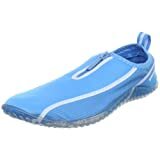 Those water shoes are available in a number of colors, styles, and materials. The Northside Men’s Brille II Water Shoe has a very thick rubber sole to perfectly protect your feet in rocky environments. Additionally, there is some arch support that makes them feel quite comfortable on your feet. On top of that, they’re dressy enough to be worn casually, say, when you are walking to the store. The Northside Men’s Brille II Water Shoe has a couple of downsides to it. To begin with, the double layer of fabric on the heel that is open at both ends and the removable sole inserts were featured to maximize comfort. However, aside from comfort, they act as sand traps, making the shoes heavy and difficult to walk in. they also don’t dry as fast as some reviews out there will have you think. From the moment you set your eyes on it, you will notice the high-quality materials and thoughtfulness that was put into designing these water shoes. Its simple design features a mesh top with an almost seamless build, with only one toe seam lying flat against the skin. This prevents blisters and irritation when the shoe gets wet by reducing the chances of your shoe rubbing against your skin. The mesh fabric is not only extremely lightweight but also has large pockets. These work to reduce the overall weight of your shoe when wet by allowing water to move in and out freely, draining, and air drying them in a matter of minutes. Since the Zhuanglin Men’s Quick Drying Aqua Water Shoes can double up as your normal everyday casual shoe, the mesh is also for allowing your foot breathability when you go for long summer treks. The ComforDry sockliner inside the shoe is for additional cushioning and comfort, creating a healthier foot environment. The rubber sole is neither too soft, nor too sturdy, and can handle long hikes while maintaining comfortability. The Zhuanglin water shoes fit snugly and has an anti-slip design to easily navigate across slippery surfaces. Due to their lightweight design that gives one a barefoot-like feeling when wearing them, the CIOR Aqua Shoes have met the need of many, and as a result, received a lot of positive reviews from the market. One of the things that makes this such a lovable unit is that there is something for everyone; women, men, and children as well. It has an ergonomic design that accounts for its non-slip function, and a toe and heel cap to ensure that your feet are safe. The upper portion of the CIOR aqua shoes, unlike most other units, has an elastic Velcro strap finish. This allows you to adjust the shoe to fit perfectly, further increasing the versatility of the unit. The blend of polyester and spandex, combined with the seven drainage holes, make the CIOR dry very fast. The quick drying technology comes in handy, ensuring added flexibility for water aerobics. Additionally, the durable rubber soles on the unit with arch-support makes this a very flexible unit and can be used for many other activities that don’t necessarily involve water. Such activities include windsurfing, cycling, jogging, walking, yoga, and driving among others. Whatever adventure you decide to go on, be it on land or aquatic, the Surfwalker Pro 3.0 Speedo water shoes deliver lightweight protection with a mesh upper for a snug and breathable fit. Unlike some of the options discussed in this guide, these Speedo water shoes are available only in full sizes, without a half-size option. They have a simple build, made of fast-drying materials that provide the ultimate breathability. The outsole makes use of S-TRAC thermoplastic rubber for flow dispersion and water management, thus the high traction. The Speedo Surfwalker Pro 3.0 can be used for pools, beaches and also jump in muddy pools without worrying that it will come off. For added convenience when putting it on and taking it off, it has a heel pull loop. Each pair is comfortable, stylish, and practical but most importantly, they are durable to last a very long time without needing repairs or replacement. Provided by a reliable and reputable watersports brand, the Speedo Women’s ZipWalker Water Shoes are comfortable, flexible, and totally lightweight, which is what almost everyone looks for in a water shoe, right? While they are a step-up from some of the options discussed in this guide, they still remain as affordable so they are the way to go if you want the best value for your money. They are extremely lightweight as facilitated by the mesh panels on the upper side, which is also responsible for ventilation for the best foot environment. The rest of the upper side, like in most other water shoes, is made of neoprene. The S-TRAC outsole provides a ton of traction while making sure your feet are not dragged in the water as a result of the resistance. The outsole doesn’t have drainage holes, but with the high-quality materials and upper mesh, the ZipWalker dries just as fast as it would if it had the holes. The ALEADER Women’s Aqua Water Shoes is the best blend of a quick-drying, breathable water shoe and a solid everyday shoe. It has thick mesh fabric on the upper side, and that is where it derives the “quick-drying” name from. The thick mesh holes allow for fast air-drying as well as provide maximum breathability. The ALEADER Quick Drying Aqua Shoes feature a ComforDry sockliner inside it, to increase the padding in the shoe for comfort. The sockliner is removable and helps aerate the interior of the shoe resulting in a cleaner and drier environment. It also eliminates the need for socks that can weigh you down. The advanced technology that is used on the Solyte Technology midsole allows the shoe to perform well without weighing you down. It maximizes the durability while giving your water shoes an airy bounce. Additionally, the ALEADER Quick Drying Aqua Shoes has a patterned anti-slip rubber sole so you don’t have to worry about slipping when wearing these shoes. They have a tight, comfortable and snugly fit, so it is not possible to lose either in the water. If by any chance you do, it floats on the surface. One of the best water shoes is an excellent choice if you have a wide foot. They are made from a synthetic material to ensure durability, aside from providing your feet with an accurate and comfortable fit. At a bargain of a price, the features that you find on the Wave Men’s Water Shoes makes this a very valuable unit. Certain features such as a studded outer rubber sole and stud-tractioned bottom make the Wave Men’s Water Shoes very versatile, coming in handy for other activities such as climbing. The anti-slip feature allows you to climb slippery and steep surfaces easily. If you struggle with laces, you will be excited to know that instead of the pesky little laces, the Wave Men’s Water Shoes comes with a zipper on the top. This makes it easier to slip on and off and is also an additional measure to ensure that your feet remain in your shoe. Additionally, a heel finger loop is included at the back to further simplify slipping on and off. With seven different sizes, there is something for you from Wave. For the reasons that I am about to share with you, the ALEADER Women’s Mesh Slip-on Water Shoes are among the highest rated in the market. To begin with, the water grain outsole makes this the ideal shoe for use in water. It provides exceptionally strong traction that grips rocks even when wet. 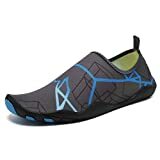 Secondly, ALEADER Women’s Mesh Slip-On Water Shoes come featured with a ComforDry sockliner that offers an awesome cushioning performance, ensuring that the inside of the shoe remains dry, healthy, and cool. Third, the unit comes with a Solyte midsole. Most water shoes, when you step on water, become really heavy. The Solyte midsole not only ensures that the shoe remains almost as light as it was when dry, it also provides an exceptional bounce-back feature unseen in many other models. Lastly, the upper mesh allows air to flow in and out of your shoe, resulting in maximum breathability, comfort, and durability. Furthermore, to aid in quick drying, there is a hole featured at the bottom. The Easy USA Water Shoes are innovatively designed, and come in a number of full, and half sizes to ensure a comfortable, snug fit. Second, the convenience of the unit had to be top-notch. These shoes are very easy to slip on and off, requiring little to no effort. Additionally, a cord is featured at the back of the shoe to tighten it around your ankle, preventing sand and debris from getting inside. They are also exceptionally lightweight and adds very little weight if any, on your feet. Most importantly, the best water shoes have to be backed by a number of positive reviews. Who else is better suited to tell you how good or bad a product is that the one who has tried and tested it? Apart from the criteria, it also had to have the other common features of water shoes such as; anti-slip, durability, and quick drying. The Easy USA water shoes are no disoutable be the best water shoes in 2019. With a bit of luck, the above review has gotten rid of the challenges and confusions that you had. I am certain that you are now ready to choose the best pair of water shoes. One thing to remember is that nowadays, manufacturers produce shoes that are usable beyond water sports. Some are also so stylish, that if matched with the right clothes, could create a unique style.